With the icing filled bag and round tip size #5 draw the sign on the cake top. Draw your letters on the sign. Instead of Sesame, draw the child's name and then add street. Refer to the picture. As you can see this cake was for Ryan. On the half circle at the top middle of the cake you will put the birthday age in the center, making it larger than the before and after numbers. It was Ryan's 2nd birthday so the "2" is in the middle and larger. Another example is the child is 3 so you would put the large "3" in the center, the "2" is before it, and the "4" is after it. "Mommy, Elmo knows my name!" 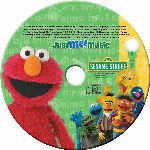 Delight your child with a personalized Elmo music CD where Elmo actually sings to your child using his or her name! With white icing and the star tip size #18, do the letters and numbers using a single line. Next, make a bright yellow icing. Use the same size star tip (#18) and do a yellow border around the sign and numbers using a double row. Next make a green icing and use the star tip size #18 and fill in the rest of the sign. 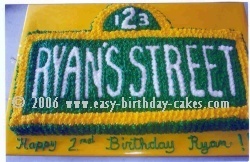 Change the tip to round tip size #5 and write any birthday message on the board in green icing.